The boxing schedule is pretty thin for the month of October, especially now that the world heavyweight title fight rematch between the troubled Tyson Fury and the incredibly frustrated Wladimir Klitschko is off – possibly for good. 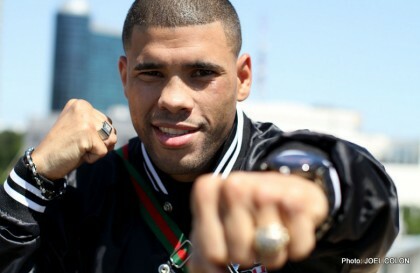 One former champion who once lit up the lower weight divisions with some truly incredible action will make what could be called a surprising return next month, as Puerto Rican warrior Juan Manuel Lopez will return after a two year layoff. The decision Juanma made to return to action may have surprised some, but not others. Lopez, despite being brutally knocked out too many times to want to think about, is one of the long list of fighters who simply cannot quit. Lopez is only 33 yet he has endured a hard, at times punishing career. Set to return to face countryman Wilfredo Vazquez Jr in a genuine grudge-match on October 8 (on pay-per-view at that), Lopez, 34-5(31) has somehow convinced himself he is “better than ever,” with all the old cliches a past his best fighter comes out with when attempting to regain past glories being thrown in for good measure. Once a warrior always a warrior, is as good a way as any when it comes to describing Lopez. Who knows what we can expect from the fight that will go ahead in San Juan next month? Vazquez, 24-6-1(19) is also past his best and he has been inactive as of late, but the slightly younger man has not suffered the same nasty KO losses Lopez has (Vazquez being stopped just once, by Jorge Arce back in 2011). Lopez and Vazquez will return as super-featherweights and who knows, the fight may wind up being competitive, even exciting. But in truth, neither guy should really be fighting on; least of all Lopez. Once a terrific fighter who thrilled millions, Lopez risks his long-term health by fighting again. Dreaded is the thought of what Lopez might do if he wins on October 8. Will you pay the asking price of $29.95 to see this fight?